Flipkart has announced The Big Billion Days Cell. The Big Billion Days Cell will begin on October 10. This cell will last till October 14, which will be available for five days in the sale of discounts and offers on mobile, gadgets, TVs, large appliance and other products. Flipkart has partnered with MasterCard this year to give many options to customers. 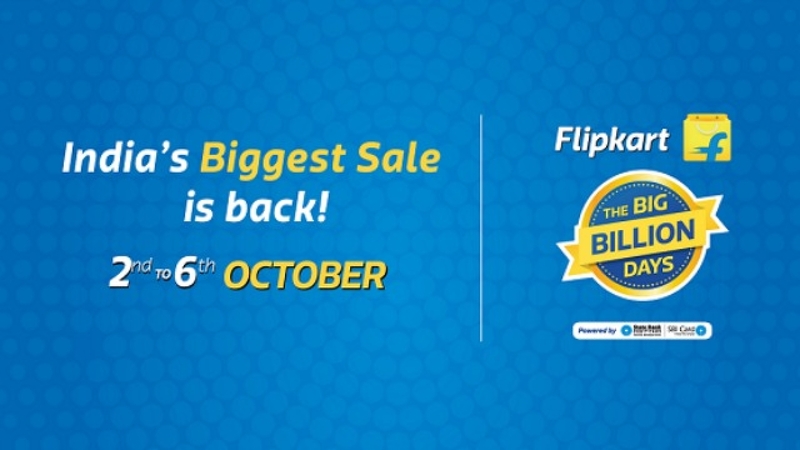 Flipkart's countermeasures company Amazon is also coming out with a festive season sale. However, the company has not yet announced the date. It is believed that Amazon's 'The Great Indian Festival' cell is likely to be launched during this time. On the first day of the Big Billion Days Cell, offers on Fashion, TV, Appliances, Furniture, Smart Devices and other products. On the second day, smartphones and other electronic products will get great deals. Offers will be offered on all products in the next three days. According to Flipkart, apart from discounts every hour, in the flash cell and every eight hours, customers will get new deals. This year you will get many payment options in the Flipkart Festive Season Sale. With a select debit and credit card, Bajaj Finserv will also have an unlimited interest EMI facility. Flipkart cashless credit will also be provided to the customers. You can make up to 60,000 worth of shopping, this amount is back to you in easy installments. Apart from this, you can also choose the Pay Later option. This means the shopping bill will be paid next month. Flipkart Plus members will be able to access the deals three hours in advance of the sale. The phone pay user will receive many cashback offers during the sale. Flipkart has claimed that during the sale, the company will also offer a discount on company travel and mobile recharge for Android users.